Pristine Ranch home 3 car Garage backing to the Buffalo Run Golf Course. 2 bedrooms plus an office with classic French drs on main level. Another Bed and Bath in the huge partially Finished Bsmt. You'll love the Open kitchen with a huge island White Quartz Tops Farmhouse sink Double ovens Gas Cooktop Stainless Appls Huge Pantry. Washer Dryer is included. The Back yard is fenced and landscaped, with a covered expanded patio to Hot Tub,relax, and enjoy watching the Golfers on the 1st hole putting green. Home systems include a leased Security System, Sump Pump, Water Softener, A/C, Ceiling Fans and a Humidifier!! Over 100k in builder upgrades, $2000 alone dedicated to a TV and internet in the future workout room. 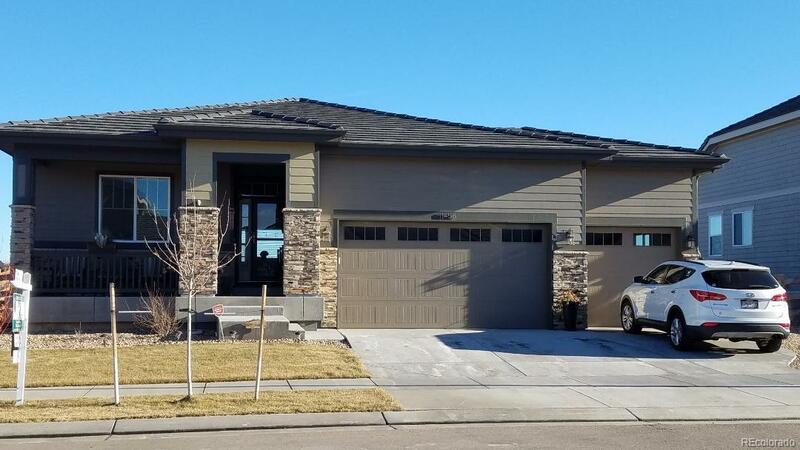 This home is fantastic and move in ready!! Offered by Key Real Estate Group Llc.